Lots to talk about this rainy Burgh morning (Ben, Bruce, and big changes afoot, oh my! ), so while I write that up, here are some things you can read. 1. One on the list of eleventy-two reasons why I’m a bad Burgher is that I’d never set foot into Penn Mac until very recently. My Strip District excursions were usually of the summer variety. Walking the sidewalk sales. Stopping at Primanti’s and more recently, the Public Market. 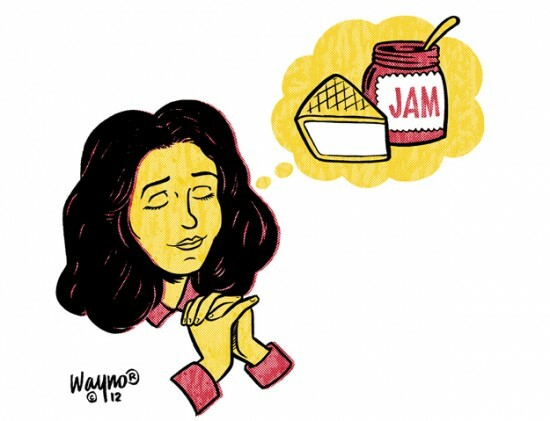 My latest Pittsburgh Magazine column is all about how I have finally learned there are more than ten types of cheese on the planet, and how I finally learned that jam doesn’t just go with peanut butter. As a regular ’Burgh girl who generally has ignored the fancy cheese aisle at the Iggle, I considered cheese to come in about 10 varieties: Colby jack, pepper jack, muenster, Swiss, American, Mozzarella, provolone (for fancy times) and various degrees of cheddar. At Penn Mac, I was faced with a towering menu filled with hundreds of foreign cheeses that sounded like snotty royal surnames from tiny European countries: Piave. Padana Grana. Malvarossa. Istara. Naked Goat. … OK, maybe not the last one. Go read about how I got all refined n’at and how my family got all refined n’at, Gov’nah spot of tea something something bugger. And go read the hilarious subhead that editor Sean Conboy threw in there. We are 12, Gov’nah. Also, guest appearances by Jen England and Dok Harris in that column. 2. I have a new post up at Pittsburgh Magazine where I share three recent Burghy discoveries that maybe some of you had already discovered. A local college student Gr0glmann (that’s not a typo. He has a zero in his name. It’s no Beezow Doo-Doo Zoppitybop-bop-bop, but still very cool.) who designs retro cool board game and LEGO jewelry to help pay his way through college, a new Pittsburgh art print perfect for a modern office, and handmade Moop bags, made right in Pittsburgh’s West End and featured on Dooce.com and Lucky Magazine. Check them all out! I’m saving up for a Moop bag now. Then I’m going to take 47 pictures of it and sell prints on Etsy. 3. Finally, I answered some questions for the Luminari Foundation’s Thinking Beyond the Box feature. Go read about the three people I’d have dinner with, my first thought in the morning, my favorite movie of all time (I bet you guess wrong before you click over. It’s not what you think it is. ), my favorite discovery, my most significant lesson learned and more. I honestly didn’t over-think those answers as some will do when asked these types of questions. Those are the first answers that popped into my head. No going back and editing. The real me. I think you need to upgrade to 57 prints…this is Pittsburgh, after all. Various Degrees of Cheddar would be a good band name. I’m so ordinary, my favorite cheese is Co-jack. I’m glad you didn’t invite Jesus to your imaginary dinner, as so many people seem to do. First: Living or dead? There’s all kinds of theological hell to pay on how you answer that one. Second, Jesus notably chose to dine not with the pious folks of the time but with the sinners, and he would inevitably explain to them how they should repent and sin no more and sell all their worldly goods and give to the poor … that kind of thing. Me? I’m picking you (for the funny, and you’d better be funny in person or NO Nutella-based dessert for you), Scott Smith, from East End Brewing (he can bring the beer), and Christina Hendricks (because I’m shallow and superficial that way). *–But if you INSIST on inviting Jesus, how about livening things up and inviting Judas Iscariot and Hitler too. THERE would be some fireworks to rival Skyblast, my friend. First, I’m tickled pink that you included me! Though I think this counts as yet another chunk of my 15 minutes of fame gone and dammit, I keep meaning to be famous for something awesome like curing cancer or saving babies. Second, Bucdaddy, no Jesus? Water into Wine! Best. Dinner Guest. Ever. –especially if you can convince him water into wine and/or beer upon request. I thought of that and rejected him (Him) anyway. Now if I were catering the wedding at Cana, sure.